Xerneas-GX is a Basic Fairy Pokemon-GX, 180 HP, with a Metal Weakness, a Dark Resistance, and a Retreat Cost of 2. Overrun is pretty basic, a 1-for-20 that also hits a Benched Pokemon for 20. Aurora Horns is a 3-for-120 vanilla move – makes Xerneas-GX seem pretty straightforward. And then Sanctuary GX is a 3-Energy move that moves all damage counters on all of your Pokemon to the Active Pokemon. Xerneas-GX seems pretty open-and-shut to me at least. You use Overrun to set-up a bunch of Pokemon, and then ram Aurora Horns into them until you win, and if things get hairy, you “heal” yourself with Sanctuary GX and dish out a lot of damage at the same time. It’s pretty straightforward. The problem that I’m seeing is that Sanctuary GX isn’t gonna KO anything you’d want to KO with it unless you’ve got other Pokemon out and about on your Bench that are taking damage somehow, and I can’t say there are a lot of situations where you’d be willing to Bench Pokemon with damage rather than take a KO in order to promote an attacker. I mean, why stall out a primary Guzma target when it’s better to let your opponent have the KO and set-up a new attacker in its place? Overrun is probably too weak in the long run though, and Aurora Horns isn’t enough on its own to make Xerneas-GX “good”, even if it can 2HKO most anything without a boost. But I don’t think Xerneas-GX is anywhere near the competitive level…although he’s closer than his brother. Arora Notealus: I feel like the Xerneas-GX and Yveltal-GX cards were done more for the collectible appeal rather than as anything on par with previous incarnations like Yveltal-EX or Xerneas with Rainbow Force. Then again, you expect so much from a big strong legendary Pokemon, it ends up disappointing when they don’t have a card of equal power or value. Never fret though, there will always be other better cards. 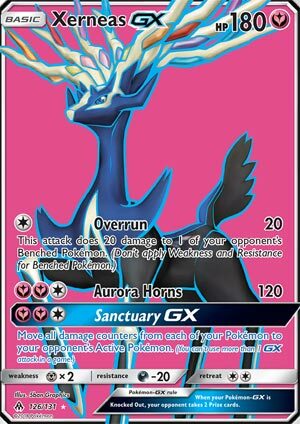 Side Review: Ultra Necrozma-GX – speaking of legendaries with powerful cards, it’s no surprise that Ultra Necrozma-GX has made a pretty big impact on the scene, but the deck has a major weakness in its reliance on Malamar. Not that the threat of losing Eelektriks ever stopped the rise of Rayquaza-EX back in the day. On top of that, he’s got the advantage of Ultra Space to search him out, Beast Energy <Prism> for extra damage, Beast Ring for that niche Energy rush, and partners like Mimikyu and Dawn Wings Necrozma-GX to work with. Certainly a contender at Worlds to be sure. Weekend Thought: What did you think of this week’s cards? Think that they might be underpowered or underrated? Are they actually stronger than what one might give credit for? What uses can you find for their strengths? How can you overcome their shortcomings? And now for the other legendary Pokémon! Xerneas-GX is very much like Yveltal-GX that it has two mediocre attacks and a potent GX attack. It is a Basic Fairy Type with 180 HP, weak to metal, resist dark, and retreat of two. Overrun does 20 for C and 20 to one of your opponent’s bench Pokémon. After seeing other Pokémon that does 30 front/30 snipe even for one specific energy, Overrun does not excite me, though it is still adequate. Aurora Horns costs YYC for 120 damage, stronger than Yveltal and can hit for weakness! Sanctuary GX would be pretty good depending on how bad your board state is. It takes 25 total damage counters to OHKO anything in the game bar enhancing items that bolsters the HP. And since it says that you move all damage counters from your Pokemon to the Defending Pokemon, that means you damage the Defending Pokémon AND heal all damage of your Pokemon, technically speaking, which is huge! However, like Yveltal, that requires good timing, as this attack’s effectiveness is diminished if there’s too little damage on your field. If I were to use one of the two, it would be Xerneas GX more frequently than Yveltal GX. Xerneas GX (FLI 90) leaps back into the meta out of the Forbidden Light expansion set. Xerneas’ first attack is an inferior Jet Punch, doing only twenty to both the active and a benched Pokemon. Its main attack, costs two Fairy and a Colorless energy, and does only 120 damage with no additional effects. Its GX attack, Sanctuary GX, allows you to move all of your damage counters from all of your Pokemon onto your opponent’s active Pokemon. I tried to tech Xerneas into a build similar to FrostBiter12’s Talonflame Gardevoir deck. I only played six matches with it, going 3 W 3 L, but more important than the number of wins or losses was the fact that I frequently didn’t want to play it because it’s a fairly easy two prize knockout. I actually just looked at a number of my most recent decklists, and I realized I haven’t teched Tapu Lele GX into any of them, not even as a one of. 170 (and maybe even 180) has become the new 110. Gardevoir does much more damage than Xerneas, and I never really had the opportunity to try to use the Sanctuary tactic, but like I said towards games four, five, and six I pretty much just passed on putting Xerneas into play. Considering I’m now 18 W 9 L with my version of TF Gardy, I would say that you’re better off skipping the Xerneas GX tech in. I’m certainly not going to try to make it a feature Pokemon.